Summer is approaching in its usual mercurial Pacific Northwest style – breaking high temperature records one week and enveloping us in June gloom the next. 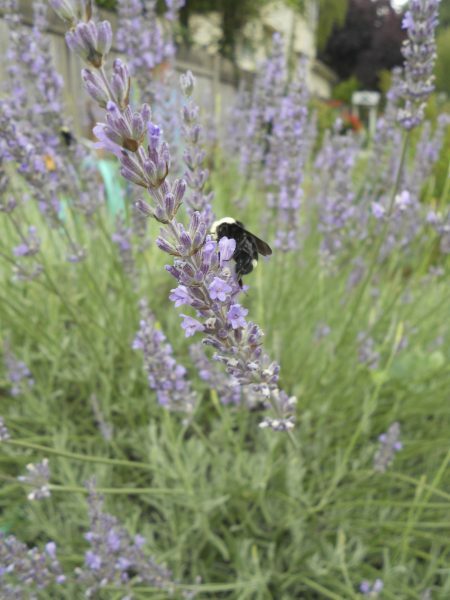 Our local pollinators pay little heed, staying focused and intent on their tasks in our blooming gardens. Many of us barely notice the purposeful travels of our insect companions, brushing away a bee that buzzes too close or ignoring the tiny syrphid fly as it hovers under our noses. Yet these little garden companions afford us the privilege of enjoying the beauty and bounty of our gardens each summer. Park yourself near a purple swathed lavender plant right now and try and count the different types of insects gleaning its riches. It is an amazing experience. While honeybees are the most well known of our little heroes, native fauna like bees, beetles, flies, bats, birds and even spiders are crucial to successful pollination. Without their service we would have a meager harvest indeed. The value of native pollinators has many facets – they are acclimated to our climate and many of them come out earlier in the season, for longer in the day and in cooler temperatures than their European cousins. They recognize native plants as sources for food and shelter ensuring the continued blessing of our northwest flora, even in urban spaces. And they are beautiful! According to the multiple year study of the Urban Pollination Project , which observed pollinators on tomato crops in local Seattle gardens, the primary bee responsible for the joy of fresh tomatoes on our dinner plates each summer is the Yellow Faced Bumble Bee, or Bombus vosnesenskii. This species of bumble bee is a familiar denizen of our plots. with the queen emerging early in the spring, wholly dependent on the availability of flowers in her vicinity to nourish and allow her to start her colony anew. With every third bite we take dependent on a pollinator we owe it to them to ensure we are providing for their needs in return. The added bonus we get for this benevolence is a kaleidoscope of color and scent in our gardens and the joy of watching them forage. Learn to recognize your local native friends and about what plant and habitat features will keep them around your garden. Ana’s hummingbirds winter over in the northwest and need early season bloomers like red flowering currant and mahonia. The early emerging bumble bee queens and mason bees need early herbaceous flowers like wallflower, forget-me-nots and spring clovers. Summer solitary bees and a rainbow of butterflies will come in droves when you plant a diverse mix of vigorous bloomers – perennial and annual – that bloom from spring through fall. 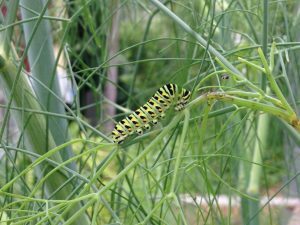 Be prepared to tolerate some plant damage if you are lucky enough to host butterfly and moth larvae or leaf cutter bees. Their contribution to the health and well being of your garden far outweighs the minor cosmetic damage their feeding incurs. Include late blooming perennials like sedum, purple coneflower and asters to ensure the late crowd their fair share of the meal. Honeybees are one of the latest foragers in the fall and depend on a robust harvest of pollen to get their colonies through the winter. All pollinators need space to roost, shelter and nest – from small rock piles, to bare patches of ground to deep shrubby thickets and hollow plant stems. Adding a water source that is safe and clean will also encourage them to stick around. 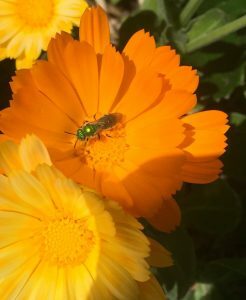 Eliminating pesticide use in your garden is the one of the most important things you can do for the well being of your pollinators. Insecticides are designed to kill insects and won’t discriminate when the spider trundles over a treated leaf or the glittery green sweat bee lights on a poisoned wild rose blossom. Since we cannot sequester plants in the landscape when we spray, we should try alternative methods to manage pest insects. The same practices that bring in pollinators also bring in a horde of hungry and ingenious predatory and parasitoid insects, some of which are also pollinating your flowers. They will make short work of the vegetarians amongst them! Help them to help you succeed.